This BLT dip is a creamy ranch dip topped with crispy bacon, romaine lettuce, diced tomatoes and green onions. An easy appetizer option that’s perfect for any party! I love a good BLT sandwich, and this recipe incorporates all of those great flavors in dip form. Serve with croutons, crackers, chips or veggies for an unexpected yet welcomed snack. When I go to a get together, I always check out what dips they have because it’s one of my favorite aspects about parties. 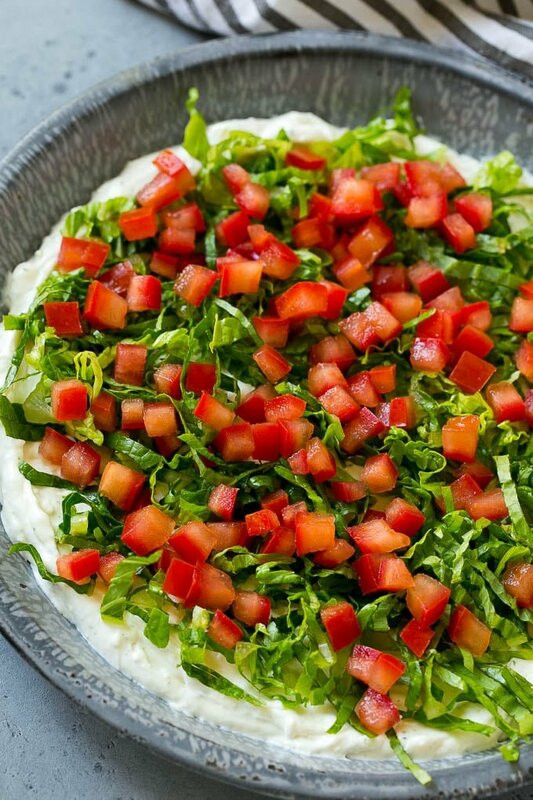 I love taking this BLT dip to any group function because it goes over so well every time. Of course, with bacon involved, why wouldn’t it go over well?! 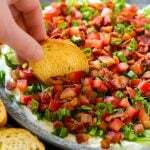 HOW DO YOU MAKE BLT DIP? 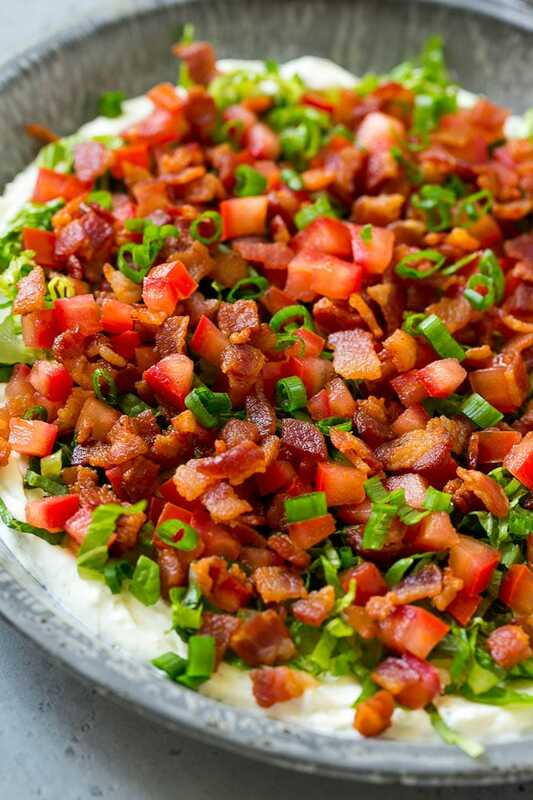 This bacon dip is deliciously creamy– it’s a ranch flavored cream cheese base topped with bacon, romaine lettuce, diced tomatoes, and green onions. It takes just minutes to put together and has all the familiar flavors of the classic sandwich, but in dip form. 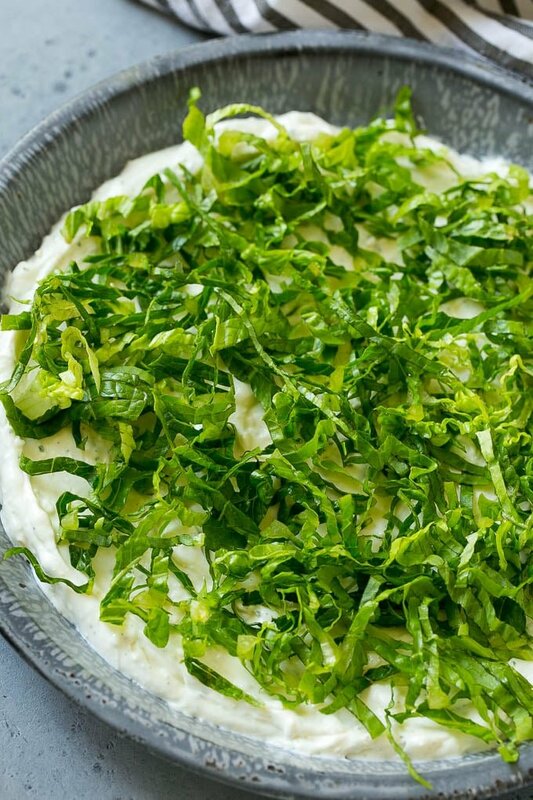 This recipe uses a combination of cream cheese and sour cream for the ranch base. If desired, you can use mayo in place of the sour cream. Not a fan of romaine or don’t have it on hand? Try iceberg lettuce instead. I serve this bacon ranch dip with baguette croutons, also known as crostini. Crostini can typically be found in bags in the deli section, near the pita chips. 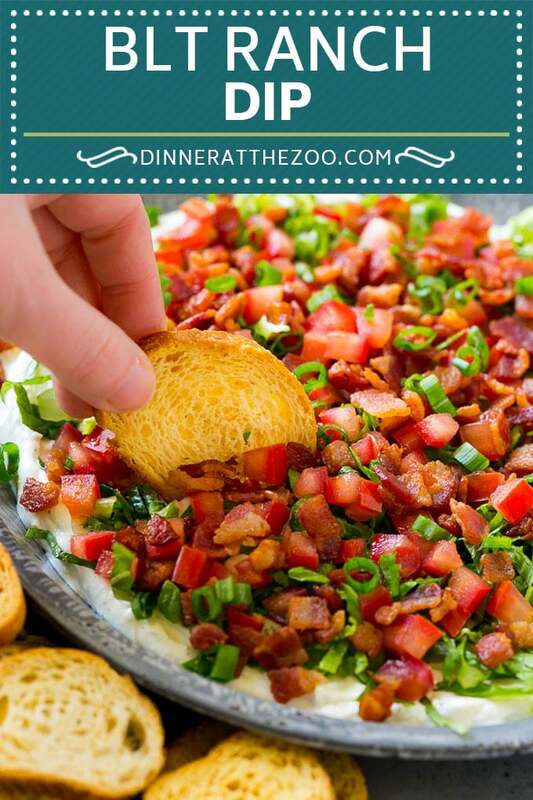 One of the best aspects about this BLT dip is the fact that the main ranch dip layer can be made ahead of time. However, the other toppings will need to be prepared and added right before serving or the lettuce will wilt. Although I’m sure most know the answer to this, BLT stands for bacon, lettuce, tomato. That’s why this bacon dip recipe has very specific layers. There are many recipes that adopt the BLT theme and a sandwich is the most popular. WHAT’S THE DIFFERENCE BETWEEN ICEBERG AND ROMAINE LETTUCE? There aren’t many noticeable differences between the two types of lettuce. However, there are a couple and the largest one is the amount of nutrients. Although both contain the same nutrients, romaine lettuce contains a larger amount of those nutrients. Romaine lettuce is also darker in color and has a little more pronounced flavor. This BLT dip was gone in no time! The combination of creamy ranch, crisp lettuce, juicy tomato and smoky bacon just can’t be beat. It’s sure to be a huge hit with your family and friends. 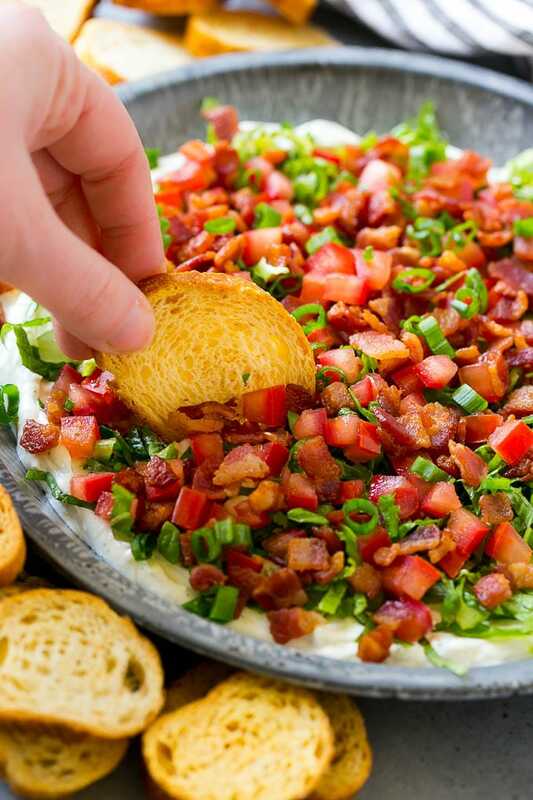 This BLT dip is a creamy ranch dip topped with crispy bacon, romaine lettuce, diced tomatoes and green onions. An easy appetizer option that's perfect for any party! Place the cream cheese in the bowl of a mixer, beat until smooth. Add the sour cream and ranch, then beat until fully combined. 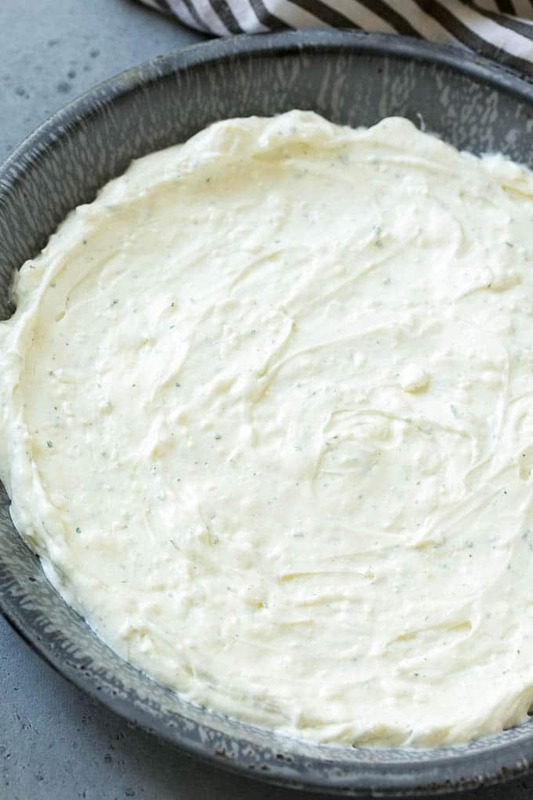 Spread the ranch mixture into the bottom of a 9 inch dish. Top the ranch mixture with lettuce, tomatoes, bacon and sliced green onions. Serve. Yes please! I could eat the whole thing myself! BLT Dip sounds so delicious! OMG this is so yum! I can’t wait to make this. This is making my mouth water! Yummy! That sounds like my kind of dip, YUM! This is my kind of appetizer!